CNN explained well “5 surprising lessons from Trump’s astonishing win”, and the historic crushing failure of traditional Presidential-year American politics, but it really boils down to one simple fact: In the battleground states, where most of the advertising dollars and get-out-the-vote money was being spent, the Trump organization made use of the Republican-Party organization in those portions of the campaign-operation that benefited from those established contacts and its tried-and-tested methods and techniques, but not in the portions of the campaign-operation that needed to be improved and to function better than in all prior U.S. Presidential elections. Whereas Sanders failed to recognize that in Democratic Party primaries there was more emotional intensity for the existing, Clinton-Obama, anti-FDR, Democratic Party, than there was for ideological progressivism (FDR’s legacy, which dominated the Democratic Party prior to Bill Clinton’s win in 1992) (and Hillary’s understanding of that turned out to have been correct), and so the incompetent but aristocracy-backed politician Hillary Clinton was able to steal the Democratic Party nomination from him, Trump was able easily to garner the most primary votes in a crowded 17-candidate field and so to become the nominee of one of the two major political Parties and go on to face the incompetent Hillary in the general election. From Bernie Sanders’s standpoint, such a general-election contest, between two candidates both of whom had hugely net-negative approval-ratings, couldn’t have made much political sense, and so he chose to endorse the thief Hillary and become a non-entity in the post-1992 and profoundly corrupt Democratic Party, instead of to found an authentically independent political movement — not political Party but political movement — which would honestly and without partisanship cherry-pick which candidates, from which of the two political Parties, will, on balance, as against the given candidate’s opponent, provide the highest benefit and least harm toward advancing the progressive cause. (That was the only constructive path forward for him after Hillary robbed him.) He chose the stick-in-the-mud route. Sanders opted to become just a cog in an ugly greasy pro-aristocracy machine, the Democratic Party wing of the U.S. aristocracy. After the Republican Party’s nomination was won by Trump (which he did honestly), he went on to build on that success an authentic anti-aristocracy (or ‘anti-Establishment’) movement, beside and outside the Republican Party. Trump — wisely, as it now turns out — chose the latter path (the original Bernie Sanders’ basic message): he was determined to retain the intensity-advantage (the ‘populist’ thrust), so as to be able to bring the largest numbers of voters to the polls on Election Day in the toss-up states and crush his opponent who was looking to win a ‘coalition’ of voting-segments: women, Blacks, Hispanics, Muslims, etcetera. She thought that those people’s personal group-identification would sufficiently surmount any negative feelings they might have regarding her long history of corrupt use of public office to advantage her financial supporters, so that she would beat ‘the bigot’, Donald Trump; she turned out to be wrong. 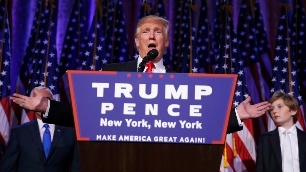 What will be the important consequences of Trump’s win? 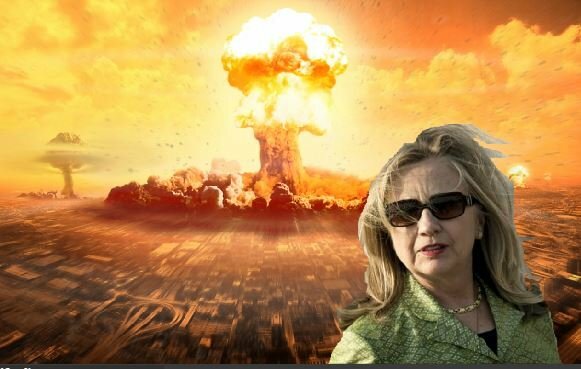 Hillary Clinton has been intensely committed to completing Barack Obama’s drive toward nuclear war against Russia, and even the question of the Supreme Court is trivial in comparison to that. Furthermore, as I argued in “I’m a Bernie Sanders Voter: Here’s Why I’ll Vote Trump”, Trump might actually turn out to be a far more progressive President than he is expected to be. But, even if that turns out not to be the case, Trump is thoroughly committed to halting America’s aggression against Russia: the biggest loser in this Presidential election is George Herbert Walker Bush, the person who in 1990 secretly established the U.S. plan to conquer Russia, which plan every U.S. President since has been carrying out, and Hillary Clinton was expecting to complete that operation. This was thus a historic U.S. election: finally, the U.S. government will turn away from the path toward war against Russia, upon which path the United States has been leading the world ever since 1990. I am shocked, and enormously relieved, at the result — even if Trump turns out to be a bad (i.e., a conservative, the opposite of a progressive) President on all other matters (including the Supreme Court). Even in the worst-case scenario, Trump will be a much better President than would the neoconservative, Hillary Clinton. Thank you, Donald Trump! Without your achievement here, the likely result now would be catastrophic, even worse than what Hillary Clinton did as U.S. Secretary of State.